Tank Lining and Rehabilitation - Premier Corrosion Protection Services, Inc.
Ammonia Tank - We were contacted by our client to survey, inspect and repair 756 concrete support piles under a 150ft diameter ammonia tank. The clearance under the tank varies to a MAXIMUM of 24". Many piles had spalling and cracking that had to be addressed. We repaired these piles per ACI and ICRI standards using high strength polymer concrete and wrapped each damaged pile with FRP composite material. 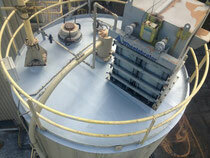 Rebuilding of deteriorated carbon-steel tank dome roof for a fatty acid tank using FRP composite materials. The roof was in such a state of deterioration that the operators leg went through it! 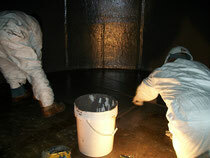 Prayon Reactor - Repairs to the exterior and interior of a prayon reactor tank using FRP composite materials. Brinks Tank - Repair and strengthening to interior of the tank, including securing "candles" using FRP composite materials. Also, repair and strengthening of the existing FRP roof. Clarifier Overflow - Lining of exterior overflow trough for a clarifier tank using FRP composite materials. Coarse Size Launderer - Repairs to heavily damaged steel launderer trough with FRP composite materials under a strict time "window"
Launderer is 75 ft. long by 5 ft. wide by 4 ft. high and had to be completed in 4 days. Dust Collector - Rebuilding and lining a 30' x 12' x 30' high dust collector with FRP composite material. Condensor / Heat Exchanger - Removal of the old rubber liner and re-line using FRP composite materials. Cyclone Washer - Repair and coating of severely corroded cyclone washer pipes usinf FRP composite materials. 37% Muriatic Acid Tank - Lining of floor and 3 ft. up the wall of a muriatic acid tank with FRP corrosion barrier. 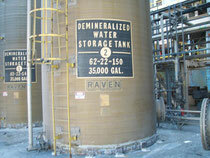 Fatty Acid Tank - Structurally rebuild the entire fatty acid tank with FRP composite materials to an approx. 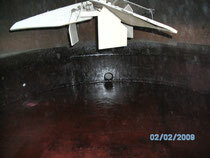 total thickness of 3/4"
Tank Roof - Repair and strengthening of tank roof. Engineers had determined that the roof could no longer support the weight of a man. We were asked to design and strengthen this roof so that routine maintenance could be done. Premier supplied a signed and sealed design from a state registered PE as well as doing the installation for a very satisfied client while the tank was still operational. Amine Tank - Coating of the floor, bottom 2' feet up the wall and coating of the agitator for an Amine tank.